I am far from an EMR expert. I have been using an EMR as an individual account for the past year. The practice that I am a part of has recently selected an EMR to implement and so I will soon transition to the new EMR. And, while I am dreading the pains associated with changing over to a new system, I am also excited for the time when this practice will be ‘online’ with EMR. I have hopes that the new EMR will facilitate increased referrals, more efficient communications, enhanced tracking, optimized scheduling and billing, and more comprehensive and efficient charting. I had a routine check-up visit in a busy clinic earlier this week. The clinic had recently changed their EMR system and I was told at check-in that my insurance information was needed again. “Ok”, I thought, “no problem.” Then, they explained that things would be somewhat delayed given the new processes that everyone was learning. Thirty minutes later, I was called in for my blood work. “Not bad,” I thought. Little did I know, this was just the beginning of a very long and tiresome morning. I waited for an additional 90 minutes for my appointment to start. By that time, I was, admittedly, grumpy. So, when the nurse came in to run through my review of systems to essentially prep the doctor, I found myself feeling rather uninterested in giving her good information. As she navigated her way through her questions – with her back to me, by the way – I hesitated each time I could have shared a symptom and instead just denied any issues, minor though they were. I was tired, hungry and annoyed. The nurse finished and 15 minutes later the doctor came in. She is an excellent doctor whom I like and trust and she apologized to start. My irritation thawed and I became more engaged in the process. And then, she turned to the computer and began to type. I commented to her about how much ‘free texting’ she had to do. She sighed and explained that at this point, she had no other options as she had yet to ‘teach’ the system her own shortcuts and templates. As I watched her type, I realized that, of necessity, she was making cryptic notations and that most of my extrapolations were evaporating into the air as I spoke them. So, despite my renewed interest in engaging in the visit, my answers to her questions became shorter and less detailed. When my appointment was over, I realized that the new EMR had pretty much decimated my visit. 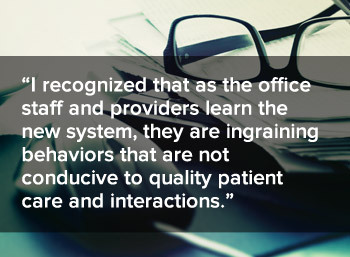 I also recognized that as the office staff and providers learn the new system, they are ingraining behaviors that are not conducive to quality patient care and interactions. My next check-up will demonstrate whether the full integration of the EMR has cemented in these poor patient care behaviors or has created the space for higher quality patient care. Either way, this experience serves as a precautionary tale for me, and perhaps others, about the importance of keeping our focus firmly on our patients and their care, in spite of the (temporary) obstacles that technology and EMRs in particular may present.